It’s easy to use. The instructions are simple, the Sevylor Madison comes with its own foot pump and inflates in around 5 minutes, and once you’ve got it pumped up all you need to do is position the seats and chuck it in the river. It’s easy to transport. The Sevylor Madison packs down into its own bag (roughly the size of a big sports bag) so is very easy to throw in the boot of your car or stash on a train/bus/plane. The bag has shoulder straps and is easy to carry, although I wouldn’t fancy lugging it long distances. It’s mega comfy. If, like me, you’re more of a drifter than a proper kayaker, comfort is everything on lazy river days. Not only does the whole boat feel comfy and sturdy, the seats have inflatable bases and excellent tensioning straps that allow you to customise your sitting position exactly how you want it. It’s easy to manoeuvre. Whether you’re using it as a two-man or one-man boat, the Sevylor Madison really does glide pretty effortlessly through the water. 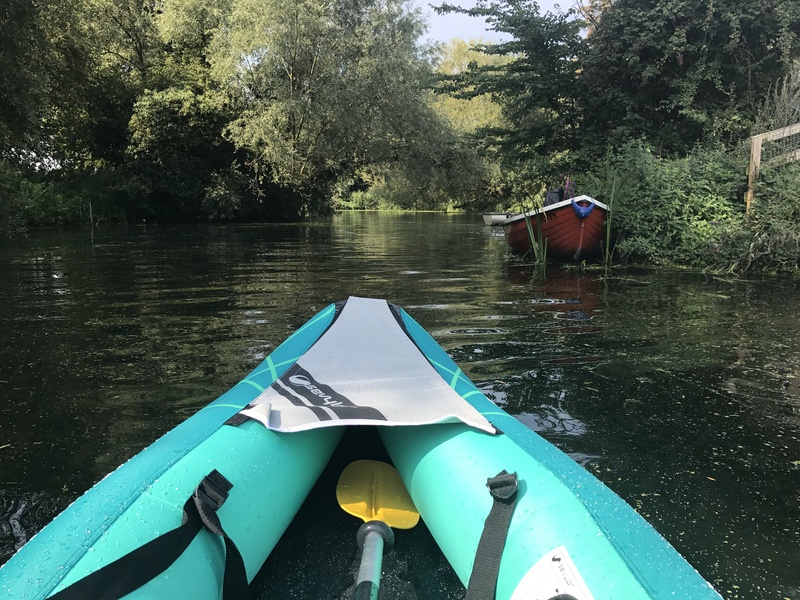 You can also move the position of your seat, so if you’re out for a paddle by yourself you can ditch the second seat and position yourself bang in the middle of the boat to distribute your weight evenly. It’s kid friendly. I still use my old inflatable kayak quite a lot (the excellent Stearns Spree 2) but it sits very low in the water so would be easier for my little boy Sonny to launch himself out of. The Sevylor Madison has higher sides allowing your little explorer to sit deeper in the boat, which feels more secure with a kid on board. It looks awesome. Be prepared for lots of jealous looks from fellow river-goers because this is a seriously good looking canoe. It comes with paddles. If you buy the Sevylor Madison inflatable kayak kit, then it comes with two sets of collapsible paddles, so you don’t have to shop around for more accessories. It dries out quickly. The one thing I really hate about using inflatable canoes is drying them out afterwards. But so far, after around five or six trips, it seems to dry quickly and not retain too much water. Which is a massive plus! It’s a fair price. £400 may sound like a lot of money for a blow-up boat, but you’re getting way more than a glorified dinghy here. The Sevylor Madison is a hard-wearing boat that should last you lots of years and create some amazing memories. I personally think it’s an absolute bargain. I’m used to slightly heavier paddles than the ones you get free with the Madison kit, which I found restricted the power and speed I could get into my paddling. It makes them very easy to transport and assemble though. The relatively high sides of the boat are superb for comfort and protection, but I’d probably prefer the Sevylor Madison to sit slightly lower in the water for ease of paddling and speed through the water if I was canoeing by myself. The perfect canoe for adventurous families. Just chuck it in the back of your car, head down to your local river, blow it up and get paddling. One of my all-time favourite bits of kit.